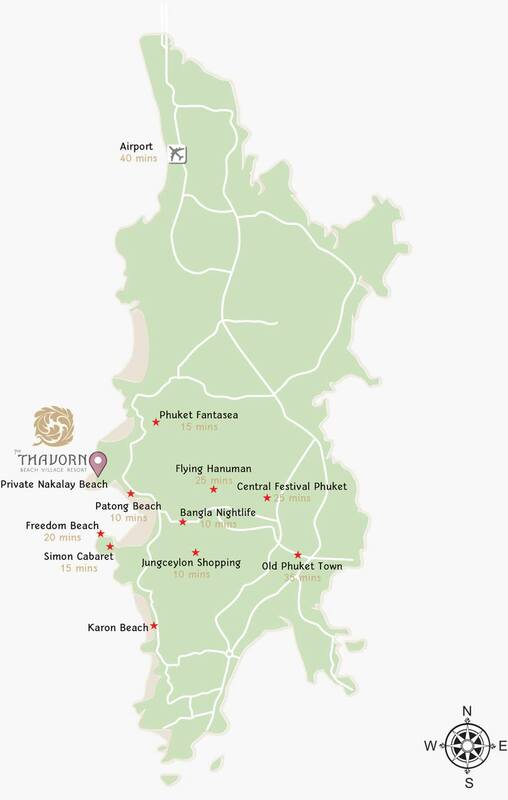 Set on a pristine private beach, Thavorn Beach Village Resort & Spa feels secluded yet close to major Phuket attractions. Enjoy the best of both worlds- the ultimate privacy as well as the complete fulfilling experiences of fun and popular activities that Phuket has to offer! Witness the breathtaking theatrical show that showcases Thailand’s myths and magic through extravagant special effects and sound systems. Packed with a multitude of fun activities and entertainment. Don’t miss the opportunity to try the top rated rainforest experience in South East Asia. Flying Hanuman is a zipline adventure through 80,000 square meters of rainforest. Central Festival is an air-conditioned, fully equipped one-stop shopping mall with a cinema. The shopping centre hosts over 120 outlets selling a range of products. Patong is one of the most well known beaches in Phuket. With a variety of nightlife and activities, it is a great place to party and play! Freedom Beach is a good choice for those who enjoys exclusivity and wants to relax away from the crowds. If you are looking for a fun night out in Phuket, Bangla should be your first stop. The 400-metre road is packed with bars, clubs, loud music, and partygoers. The 200-plus stores in this shopping heaven sell most of the things you might be looking for. A spectacular musical show performed by “Ladyboys”, the Simon Cabaret show is something you are unlikely to have seen before. The biggest transvestite show in Phuket, the Simon Cabaret show will stun and amaze you. The Sino-Portuguese architecture of the buildings lining the Phuket walking street reflects the island’s history and culture. Walking alongside these beautiful buildings will take you back to the charm and the way of living of the locals a century ago. **Complimentary Shuttle Bus to Patong beach maximum 24 persons per trip.